Editor's note: In their previous installment, Jim and Lisa reviewed eight different Bad Apple typologies that may show up on your planning commission or in your public hearing audience. Today, they will review some options and opportunities for addressing the difficult circumstances that may arise from their behaviors. There are several alternatives to consider, which we'll explore here. But before we look at what you could do, let’s look at what’s important to NOT do. 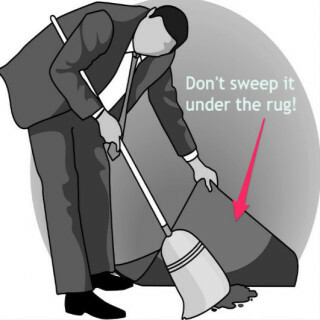 Don't just sweep a Bad Apple’s behavior under the rug and hope it improves. And until you've exhausted all other strategies, don't resign from the planning commission and let it become someone else’s problem. It’s also important to keep in mind the pernicious impact that tolerating unethical behavior has both on the planning commission and on the community. For the planning commission, it weakens the ability of members to function as an effective group, since it erodes trust. For the community, it contributes to undermining faith in government as a fair institution where everyone is treated equally. For both, it breeds cynicism. So what are your options if you believe a fellow member of your commission is acting unethically? One is to speak to that member directly. If you're hesitant to do that, or you’d like a second opinion about your concern, speak with your commission’s chair or with your planning director. This can be especially useful if you're relatively new to the commission. Before facing off with a Bad Apple, be sure you are on solid ground. Check your bylaws to see if they specify a code of conduct for your planning commission. ... If necessary, check with your local government’s legal counsel for more information and advice. Before facing off with a Bad Apple, be sure you are on solid ground. Check your bylaws to see if they specify a code of conduct for your planning commission. As appointed officials of a local government, the planning commission would also likely be subject to your state’s Code of Ethics and Conduct for Elected and Appointed Officials. If necessary, check with your local government’s legal counsel for more information and for advice on the legality of addressing unethical behavior. Once you have verified that there are standards, you can document violations to the Bad Apple. If your bylaws don’t provide a code of conduct, then one of your priority tasks should be to develop one. Potential models include your state’s Code of Ethics and Conduct for Elected and Appointed Officials, and the AICP Code of Ethics. Ideally, you could call attention to your planning commission’s Code of Conduct as a procedural matter at the beginning of every meeting, or by noting on the printed agenda that the Commission’s actions are governed by its bylaws and ethical standards. This also empowers everyone on the planning commission to help enforce the code of conduct. Lisa worked with a few planning commissions that opened every public meeting with a quick review of the sections of the bylaws that dealt with procedures for making recommendations, code of conduct, and conflict of interest. In that way, planning commission members and the public alike were reminded of process and ethics pertaining to planning commission meetings. Lisa recalls a situation in which a county planning commission was hearing a case that proposed to rezone a single parcel from residential to commercial, a proposal that was not consistent with the comprehensive plan. "One planning commission member owned the real estate firm that was handling the sale of the property, which was contingent upon the owner getting the commercial rezoning. Despite the conflict of interest, the planning commissioner argued at length during the public meeting on behalf of the rezoning. After the planning commission voted to table the matter until the county planner could gather additional information from the applicant, the planning commissioner with the conflict of interest began making threatening phone calls to other planning commission members." Serving as a planning commissioner means that your job is to focus on what is in the community’s best interest as established by the Comprehensive Plan and the Zoning Ordinance, and to act ethically. If you see a fellow commissioner behaving unethically, take steps to deal with it. To ignore unethical behavior is both to encourage it and to do a disservice to your commission and to your community. There are also ways of making sure the actions of a “bad apple” commissioner do not have negative impacts on the community. Sometimes this means dealing with underlying ordinance standards or policies that that are contributing to that commissioner’s actions. "The head of our plan commission had a distinct personal agenda, contrary to generally held public opinion and the community's comprehensive plan. Desiring greater latitude for his Confined Animal Feeding Operation, and greater leniency in local enforcement of environmental regulations pertaining to agricultural waste, odors and truck traffic, he first attempted to convince the plan commission members to vote in support of his ideas. Later he escalated to lobbying the plan commission members, and he also didn't recuse himself during voting over issues in which he had a financial stake." "Plan commission members spoke to the chairman about his conduct, but at the time Indiana had little ethical guidance in place. The situation was viewed as a difference of opinion rather than a real breach of ethics," Jim explains. "The plan commission didn’t want 'differing opinions' about a technical matter to devolve into a power struggle. We realized that our zoning ordinance was not specific on how the environmental standards for agricultural operations would be regulated and enforced. The language in the ordinance was not specific and left action thresholds up to the discretion of local decision-makers." Continuing planning commission strife over particular issues may indicate that the “fix” is in updating your zoning ordinance to close up gray areas in language that provide opportunities for power struggles. Jim and the plan commission decided that, with little ethical guidance from the state, their best opportunity for success was to clarify the gray areas in the ordinance. With the help of the Cooperative Extension Service and State Department of Agriculture, the plan commission drafted updated and specific standards to address odor control, truck traffic, and other operational concerns pertaining to agriculture that were not clear in the original zoning ordinance. 1. Are you receiving planning commissioner training every year? Many states have government institutes that offer training for appointed issues, including planning commissioners. Other state organizations, such as chapters of the American Planning Association, also offer training. Your commission’s legal counsel can also discuss at one of your regular meetings (or during a special meeting or retreat) how to handle common ethical situations, such as conflicts of interest and ex parte communications. planning commissioners who have been trained are much more successful at understanding and acting on the rights and responsibilities of their roles. 2. Do your bylaws contain a code of conduct for the planning commission and for public meetings? Revisiting these at the beginning of each meeting is a good way to establish everyone’s expectations for conduct. 3. Does your zoning ordinance contain specific standards for development and a stated intent for each zoning district? This will reduce ambiguity and help limit differences in interpretation that could result in strife. 4. Does your planning commission debrief after meetings? This can be worth the extra time, either on a regular or occasional basis. Our April 2011 PlannersWeb article, "The Value of Debriefing," describes how this simple process can help strengthen understanding and group dynamics. 5. Do you build trust and understanding among planning commissioners by sharing your stories? We can form deeper appreciation for others’ perspective when we have shared our stories. Take a look at Lisa's PlannersWeb article, "Inviting Them In: Using Story as a Planning Tool."